Raw desserts are a staple in my freezer. As in, it’s rare that you will ever find my freezer without some sort of raw confection stuffed behind bags of kale and broccoli and other cruciferous vegetables. I keep them around just in case I get a hankering for something sweet. That way, instead of sabotaging my clean diet with an entire bar of chocolate (this has happened more times in the past week than I’d like to admit) (ahem, that’s because my freezer ran out of raw brownies on Wednesday), I can satisfy my sweet tooth with something that’s naturally sweetened and made with wholesome ingredients. Unlike chocolate bars. Since that super cheesy Hallmark holiday is just around the corner (no offense if you’re into that sort of thing), I figured I’d share a little something that you can make for your honey in a pinch. You know, in case you’ve got a busy week ahead, or in case you just don’t have it in you to remake those hidden heart cupcakes you saw on Pinterest. 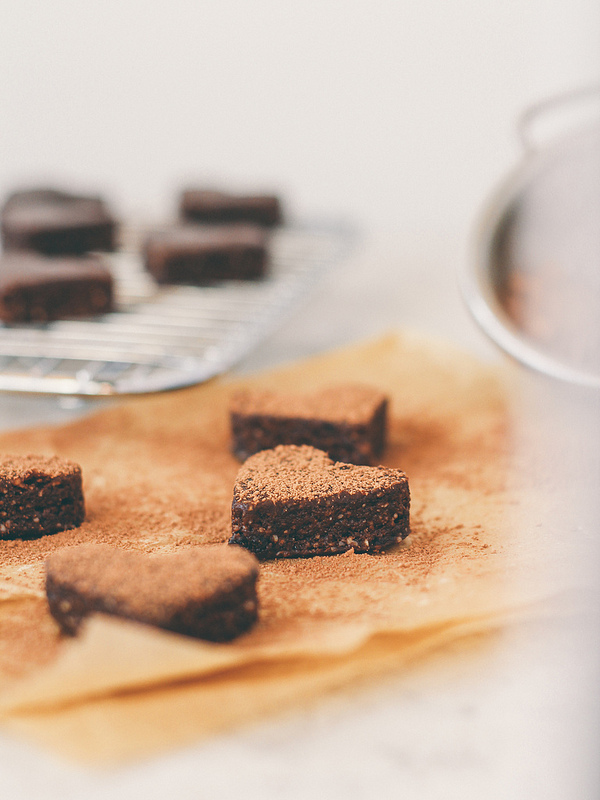 Thankfully, these brownies come together within a matter of minutes and require very little skill. Not to mention, they’re comprised of only six ingredients and are suitable for your new love interest who’s got an aversion to gluten, and sugar, and anything that comes from that animal that goes moo. Notes: If you’re allergic to almonds – or just can’t stand the things – feel free to use any other nut. Cashews and walnuts are a few favorites. Pecans not so much, as they make the brownies super greasy. If you’d prefer to bypass the whole cutting these things into adorable heart shapes because seriously who has time for that? Just roll the dough into small balls and skip to the freezing step. Simple as that. But if you’re going to skip the cutting process, I recommend mixing a handful of dried cherries and cacao nibs into the dough. You won’t be sorry. In a food processor fitted with the S blade, blend the almonds, cacao powder, and sea salt into a superfine meal. Add the dates and cherries; process for at least 60 seconds, until the fruit is incorporated. Add the water (1 tablespoon at a time) and blend just until a dough starts to form. If your dough is sticky (which means you added too much water) pat it into a flat disc, wrap with plastic, and refrigerate for at least 30 minutes, or until firm. If your dough is nice and firm, proceed to the next step. Line a large baking sheet with parchment paper; set aside. 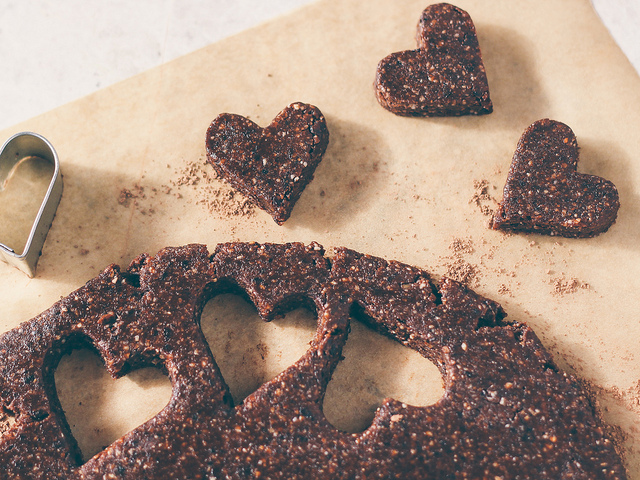 Line a flat surface with parchment paper and sprinkle with cacao powder. Roll the dough out until it’s about 1/2″ thick. 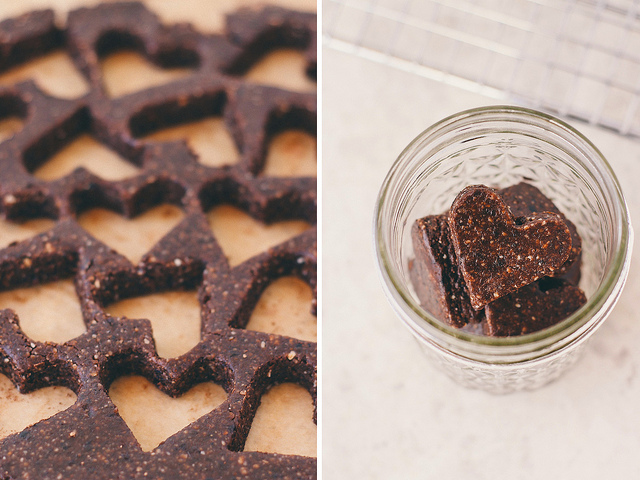 Using a 1.5″ heart cookie cutter, cut the dough and transfer the pieces to the prepared baking sheet. Repeat process with scraps. Freeze for 30 minutes then transfer to an air tight container. 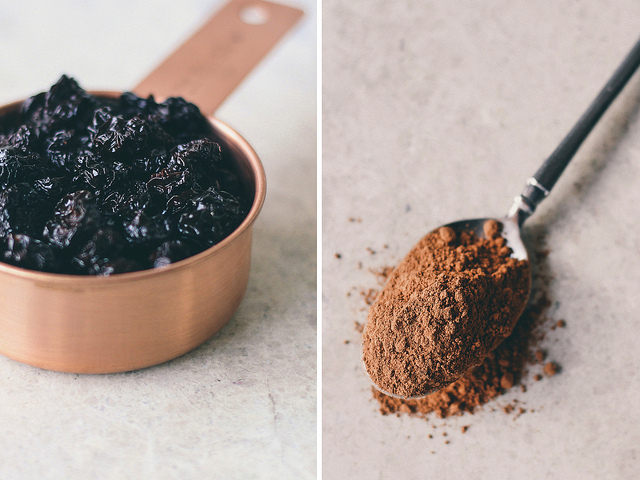 When ready to serve, dust with cacao powder. Will keep in freezer for at least 2 months, but don’t count on them lasting that long. These look insanely good. I'm so grateful that more and more food bloggers are embracing the gluten-free/paleo diet…it sure makes life easier for those of us following those diets who like to get food inspiration online! Oh my these look AMAZING! I must try to make these! Thanks for sharing! I just made these and they are divine! Contemplating taking them to work tomorrow because I fear I'll eat through the whole batch if I don't. sorry – my comment was meant for the tacos with mole sauce. but I wanted to comment on this post as well. I love the idea of chocolate and cherries all wrapped up together. Oh, yes! I am so loving this post! I am vegan and gluten-free, so this recipe couldn't be more up my alley! I get extraordinarily excited about healthy desserts. Thanks for sharing! Just wondering about the cacao measurement. Does "6 tbsp cup cacao powder" mean 1 cup + 6 more Tbs? hi laura! oops, she meant 6 tablespoons. sorry about the confusion! i didn't have cherries so i subbed dark chocolate chips instead & added a touch of cinnamon & honey., soooo yummy! I am thinking of making these to take to a party, however that would mean they were out of the fridge for a few hours.. Will this ruin them?